Easter is coming! We love crafting, creating, learning and sharing Easter themed crafts and activities. This month for our Virtual Book Club for Kids we are spotlighting books by Margaret Wise Brown. We decided to read The Runaway Bunny and do some simple bunny patterning activities! Today I'm going to share our free colorful bunny printables with you along with our easy patterning activities. To get started we read The Runaway Bunny by Margaret Wise Brown. The Runaway Bunny is a sweet book about a little bunny who tries to run away from his mom. His mom lets him know that she will always run after him and find him because he is her little bunny. I especially liked this story because lately my toddler will push back and say, "I hate you" or "go away' and I just reply "I love you" or "I'll always be here when you need me" and he can push me away but I know that he knows that I will always love him. For our bunny patterning activity we only needed a few materials. You can download our free bunny printables here. I printed out one of each color. Prior to getting started with patterning you'll want to print out the bunnies, cut them into small pieces, and organize them by color to make for easy patterning. Then you can organize your materials and start patterning! My preschooler (age 4) and I worked on simple AB patterns using her bunnies. After she arranged her bunnies into a pattern, then she added M&M bunny tails to match the bunnies. Once she discovered her favorite color combination and pattern then we used the glue to glue the bunnies to her strip of construction paper... and then she made her M&M pattern again and again... occasionaly sneaking one. For my toddler (age 2) instead of making patterns we just worked on color matching. This activity reminded me of our "Don't Eat Peep" M&M game. He glued one of each color bunny onto his construction paper strip and then he matched the M&Ms to each bunny to create bunny tails! It was fun to listen as he pointed to each bunny and told me what each color was and then tried to find the matching M&M. If you don't want to use M&Ms for this activity with your kids you could easily use colorful large buttons, jewels, pom poms, colored stones, or just simple round manipulatives. After we created for a bit then we took a break to eat everything on our boards... and then we started over again ! We don't create and learn with candy that often, so the kids thought this was an awesome treat. I put a lot of M&Ms in the bowls for my kids because they are really good at using the treats for learning first, before we eat them. If your kids are the sort that will be grabbing M&Ms by the handfuls, limit the number you set out for them. I set expectations ahead of time with my kids when I use treats for learning fun. We can eat a few while we play and if kids sneak too many then their treats get removed. My kids learned quickly to use the treats the right way. If your kids aren't ready for that and they want to do this activity then use something other than candy. You can also embed counting by counting the bunnies in each color and counting the number of M&Ms. Do you have any other favorite bunny themed activities for kids? Here are some other fun Margaret Wise Brown inspired ideas shared by our Virtual Book Club for Kids co-hosts! Such a simple activity to work on so many skills. Love it! 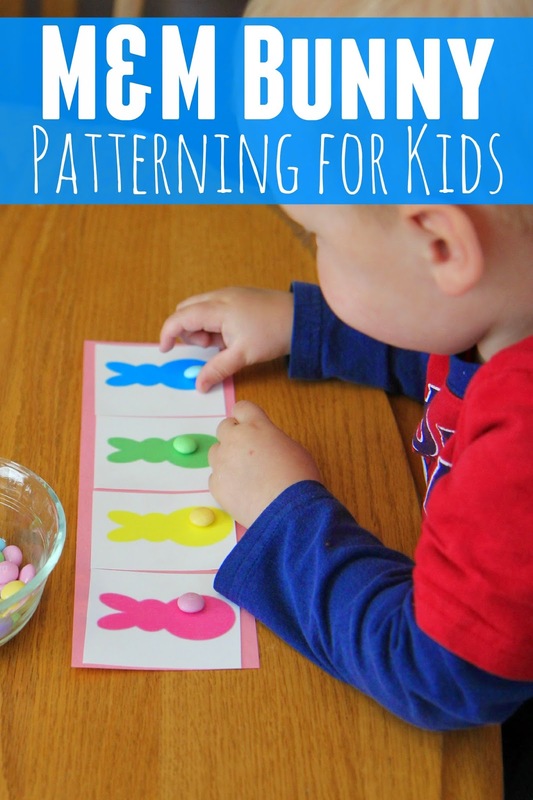 What a fabulous patterning activity for the kids to do. I also want those pastel M&M's they just aren't available here! Oh, how cute! We will definitely be using these! These are so cute and clever, thanks for sharing!